Who is our 2018 festival hero? Introducing Mr. Blair Martin, a multi-award winning Brisbane based actor, speaker, broadcaster, writer, director, entrepreneur and ‘Something Else’! In 2018, Blair will celebrate being the voice behind the microphone, the Master Herald at our annual medieval event and the announcer of all things… important or not… for the last two decades. He is also the Steward of the Hall at both medieval banquets keeping the esteemed guests, the Lords and Ladies and Very Important People, well entertained throughout the evening with his droll humor and witty wit. His extensive medieval knowledge, his spirit and pizzazz has made him a legend to many visitors to the Abbey Medieval Festival over the years. With a character that’s larger than life, a stature that leaves you in awe and admiration, the face of this 29th festival is truly our hero and has been for quite some time. Festival Hero and ‘Something Else’! Born and raised in Rockhampton, Blair has many strings to his artistic bow ranging from wildly colourful comic characters, MC services, and innovative corporate concepts and events including the Abbey Medieval Festival. Blair is a also mastermind for his ability to recall the most arcane list of facts, figures and quirky stories, and these are by no means limited to medieval tid-bits. Blair was a champion on the Australian production of the TV quiz show, ‘Jeopardy’, and in June 2007, Blair became the 6th Grand Champion of the hit Channel 9 quiz program ‘Temptation’. In 2014, Blair won one of the inaugural gold medals for the Trivia competition as part of the bienniel Pan-Pacific Masters Games on Queensland’s Gold Coast, and backed that up with a second gold medal in the same division at the 2016 PanPacs. Without a doubt, the Medieval Festival wishes to acknowledge and thank Blair for his creative and dedicated services since 1998 and we recognise, also without a doubt, that every year, he just gets better! He certainly is ‘Something Else’! Thank you, Blair. We appreciate you! Your favourite Heores and Heroines from the Abbey Medieval Festival can now be a collected as trading cards. The cards are a big hit, with online orders flowing in. The trading cards which feature heroes like the Knights Templar, Sir Liam Reilly, Alexander de Vos, Company of the Wolf, Kryal Castle, Sir Blair Martin and many more, are the first of a new range made available via the website of the Abbey Museum of Art and Archaeology. And if you order now, you can pick them up at the festival on July 6-7 at the Abbey Museum stall, ensuring you have your a wonderful souvenirs to match your favourite memories of the festival. There are 40 to collect in total, and numbers are limited. Next year it is hope the the range will be expanded. The cards are being sold for $20 per pack of five cards. Guess what this will be? Visitors to the Abbey Medieval Festival 2013 and Kids Medieval Fun Day will notice a few new additions to the site. A team of handy volunteers have been working hard setting up permanent improvements at Abbeystowe. I wonder if you can guess what this one is? Hint: It’s somewhere you can watch Gypsies dancing, listen to stories of old and be entertained by Medieval social interactions. *** Please make sure you have purchased your festival entry tickets. Joust tickets only give access to the Joust session you have booked. Joust tickets are NOT festival entry tickets. A very welcome and surprise guest at this year’s Abbey Medieval Festival, was celebrity Dr. Chris Brown. 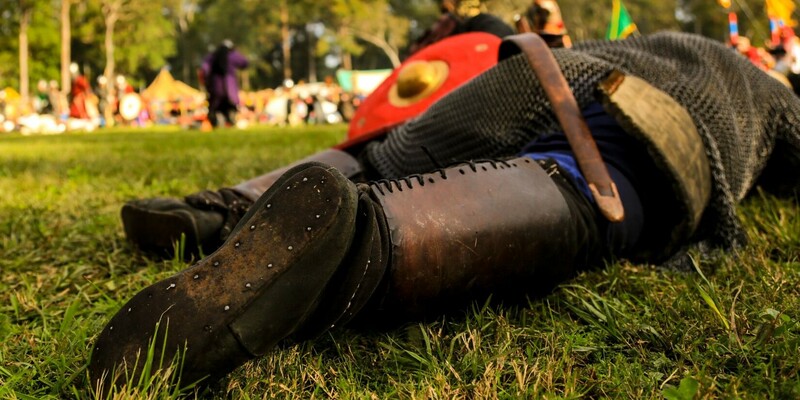 Showing up on both Saturday and Sunday of the tournament weekend, held at the well known Abbey Museum near Brisbane, Dr. Brown was in search of a medieval experience. The crowd was given a special treat. A brave and true Knight, Dr. Brown, known as the Bondi Vet and from Channel 10’s Friday night show, ‘The Living Room’, truly embraced his medieval experience. Not only did he draw a crowd….he drew a sword! With orders not to hold back, his opponent, Sir Leon Sinclair, from the medieval renactment group Eliste d’corps, as honour bade him, obliged! Clad in armour from the generous and accomplished, Sir Justyn, Dr. Brown had his first Abbey Medieval experience. The pair went at it, hammer and tongs! The crowd became noisy; their thirst for pain and blood was audible; there was no retreat for either of these warriors…. (only joking, there was no blood…was there??) but the Oohs! and Aaahs! were clearly audible around the grounds; the ladies shrieked, covering their eyes and imagining the worst for their favourite handsome knight and Sir Blair, the MC, didn’t hold back either! What entertainment! To give him credit, Chris put up a good fight, rising again and again, to face the sword. A little slower each time, but he rose, untill the crowd grew silent. Dr. Brown went down!……….. There was word of concussion! But Ladies and Gentleman, boys and girls, didn’t he look the true Knight in shining armour at this great medieval tournament? And, unlike in medieval times, he lived to fight another day, which is a good thing because we loved him and the crowd loved him. And good news! The footage for Dr. Brown’s battle at the Abbey Tournament is to be aired this Friday night (5th October), ‘The Living Room’ on Channel 10. Book the good seat in advance! Thanks Chris Brown! Come back next year for your second medieval experience! Food….preserving the body and soul! I believe that there’s an inner ‘Foodie’ in most of us, and in reality, food is linked to survival, a basic instinct. Personally I’m really happy to see that nowadays food is starting to regain the rightful and honoured place it deserves in our lives. It’s as much about giving our bodies required nourishment (and let’s not undervalue that) as being a secret ingredient in our social lives enabling us to communicate and connect. If you have ever visited European countires, particularly Spain, Italy, Greece, and elsewhere, we see openly how food is loudly lauded in the home and community. And in our own lives, we all know TV cooking shows and celebrity chefs; we have food festivals and gastronomic holidays, we are award of the role food plays in our health, we learn about slow food and organic food and as conscientious parents we try to make more time in our lives to give home-cooked food to our children. So, I think it would be neglectful if we didn’t address the question about how our ancestors ate in the Medieval era of 600AD – 1600AD. What did they eat? and how did they cook and …….I wonder what it tasted like? Experience a taste of Medieval times at the Abbey Medieval Banquets Good news! For those attending the Medieval Banquets, you will have a fantastic opportunity to experience medieval food at it’s best. The authenticity of the food available at the medieval banquet, right down to the medieval etiquette on show, is indisputable and the ingredients and dishes on the menu are exactly as they would have been in that era. You may be surprised to hear that basic staples of our daily diet today, such as potatoes and tomatoes had not yet reached Europe, so you can search but you won’t find them on the menu! And outside of the noble classes, for a lot of people in the middle ages, having food meant survival. And sadly, sometimes, people just didn’t. A staple diet of the lower classes was ‘The Ploughman’s Lunch’, so it proves to us that a good dish lasts. Meat was not available for many of the lower classes, untill ironically after the ‘Black Death’, which wiped out a third of the world’s population around about the 13C. So, over the next few blog posts, I’m going to stay on the subject of food, so that you our readers can have a little ‘taste’ of what was available during the Middle Ages, and surprisingly is still available now. This will be another opportunity for you to experience an additional dimension of preservation, which is at the heart of the Abbey Museum, in more ways than one! Abbey Medieval Festival and Channel 9’s The Voice: transformations of a kind! I have been asked to ‘please explain’ and realise that I have been dropping a distinct word in my last few posts, without clarifying it. That word is ‘Transformation’ – not one that we as adults use a lot, but ask any eight year old what a ‘Transformer’ is! So, it’s kind of the same – kind of different! Let me explain! Interesting…… I’m hoping I dont’ lose you here, but actually, you know…it’s not that deep. We experience transformations everyday. Last week, I brought my son to his karate lesson. I sat watching. The children were intense, serious and focussed. I remembered my son on those first few lessons; he was giddy and skittish; his attention everywhere. I wondered if he would ever get it. Now, as I sat and watched him, I was able to see something new; a strong gaze in his eyes, a serious face; he was absorbed. He was actively engaged and I had just realised that before my eyes, he had escaped. Yes…..NAPLAN and all the stuff-of-the-week were left far behind. He had undergone his own little transformation. And was I happy about that? Channel 9’s ‘The Voice’ – why are we all so hooked? One word: Transformation. Each of these wonderfully talented contestants are being guided through a transformation; it’s life changing, a personal journey. Let me even use the word ‘walkabout’ here. There’s no going back. Everyday, people fall in love, we experience grief, we have children born to us, or….. maybe no baby comes. Each of these are every-day, life-transformations that we as human beings experience; each bringing us to a deeper and ongoing understanding of something inside us. Ok, so what’s this got to do with the Abbey Medieval Festival, you ask? We are here to guide you through a medieval transformation. Nowadays our free time is so precious. People are working so hard for their families and to achieve their ambitions. How recreation time is spent is selective and valuable. The Abbey Medieval Festival acknowledges this! I examined what I really wanted for my own free time? I wanted a little ‘escapism’ if that was possible. Well it is! Very possible. You can escape absolutely and wonderfully so… to another era. You can transform yourself to a different century and live it, for a short time, as it was. A real medieval experience. It only depends on you. Let’s take the Kids’ Medieval Fun Day! You as a parent can witness your kids’ transformation or even partake in your own. Watch your kids as their attention towards the activities on offer changes. First reluctance leading to curiosity, then mild amusement……a little more interest is piqued, then their attention is grabbed. This leads to physical involvement and then…excitement and elation as they become totally and utterly engaged. Guiding this transformation is our job. And guess what! We are aware that some of our readers and followers are already there! In our recent competition we asked people to tell us what type of experience they would like to have at the Abbey Medieval Festival this year. Steve Springhall from Queensland said he wanted ‘the feeling of travelling back in time’…..Steve, thank you for this! That feeling is yours to have and we really would be honoured to guide your transformation. That’s all we can do. The rest is up to you. So who else wants to join in? So next time you watch The Voice, think of your own transformation. Yours to have at the Abbey Medieval Festival! So have it!